On any weekend night on South Craig Street, passersby can hear the sounds of wails accompany the tune of pop songs emitted by the karaoke house on the corner. Wedged tight among Irish cuisine and artisan jewelry, KBox Karaoke’s dim purple curtains bring private karaoke culture to musically inclined — or just fun — students and residents in Oakland. Down on the other end of Craig Street, a few blocks away, sits Phantom of the Attic Comics — a hole-in-the-wall comic book store hidden deep within a white brick complex shared with an art supply store. If either of these Pitt grad-owned businesses wanted a new website, they could go to fellow alum-owned business — Responsival — to make it happen. But KBox doesn’t rely on a website to fill their karaoke rooms — the house regularly fills with the rumble of collective banter and shamelessly cracked renditions of tunes by Fergie, Queen and Billy Joel. 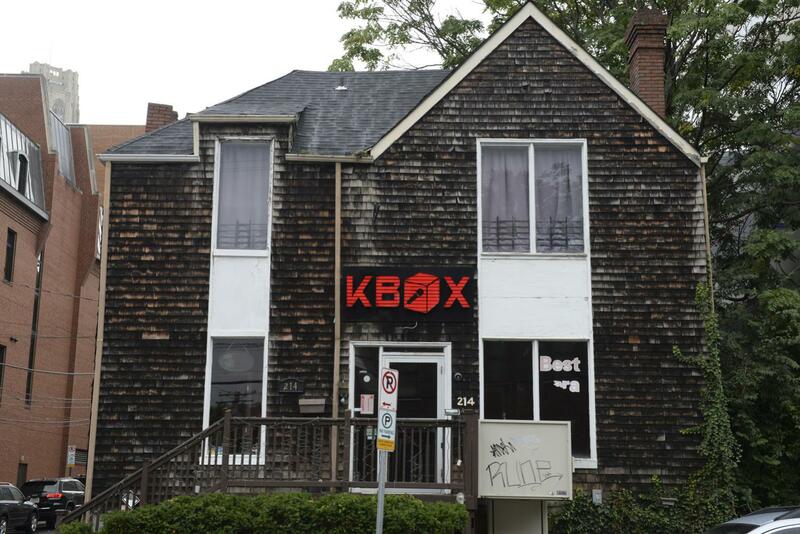 KBox Karaoke became the first private karaoke club — a karaoke house that rents out private rooms — to open in Pittsburgh in 2012, and now houses more than 70,000 Chinese, 26,000 Japanese, 13,000 English and 8,000 Korean songs. It has even started to add Vietnamese and Hindi music to its growing playlist. A group of 10 Carnegie Mellon and Pitt alumni started the business because they loved to sing at private karaoke boxes in China, but found mostly only public venues here in Pittsburgh. After conducting some basic market research and finding a high level of interest in the concept, the founders agreed that there needed to be a karaoke spot where people didn’t feel the pressure of a large audience, or fear embarrassment while having fun. Most of the students who started KBox weren’t involved in music entertainment at the time, making it difficult to allocate time to meet and get KBox started. Yanan Chen, for instance, was a chemistry PhD student working on her dissertation, and another co-owner, Min Luo, who now helps manage KBox remotely from California, was earning her business degree at CMU. In the midst of studying, working and planning logistics, the CMU and Pitt alumni were also working extensively to develop the club’s karaoke systems, including effects and lighting. After about six months, KBox was up and running. “You just need to have a job resolution that you want to accomplish,” she said. Other Pitt graduates, like Bryan Brown, entered the realm of entrepreneurship by chance when they were presented with a potentially profitable opportunity. A few months after he graduated from Pitt in 2014 with a dual degree in finance and marketing, Brown found himself trying to get employed during a technology boom in the United States. He teamed up with a friend and adviser, Joey Rahimi, whom he met through an internship while studying at Pitt, and started planning his company, Responsival. Responsival focuses on building responsive websites for electronic devices at an affordable price, primarily to help grow and sustain small businesses throughout the country. In just a few years, Responsival has developed into a diverse team of 11 designers, developers and strategists, and has satellites set up in Pittsburgh, Philadelphia, Houston and Durham, North Carolina. “I was never a good designer — never a developer whatsoever — but when this idea came up, really, I became obsessed with it,” Brown said. Despite rejections and stumbles in the beginning, he says that thick skin and perseverance are vital for any business plan to take off. Brown credits much of his success to his relationship with his adviser, and his help in starting and still actively developing the business model. Brown still utilizes the individualized focus from his advisor along with the networking skills he learned from business school to help him plan for the future of Responsival. Brown says that often the company will fly or drive out to customers across the country just to work on building a personal rapport with them and sustain strong connections. Like Brown, 1985 Pitt alumnus Jeff Yandora found his business niche through good timing and a promising opportunity. Yandora bought Phantom of the Attic Comics, a comic book and game store, in 1990, when he was presented with the chance and saw a coming upturn in the comic industry. While Yandora actually studied history and political science at Pitt, his love of comics and gaming and his inclination for a prosperous boom in the industry prompted him to pursue the business. According to the academic advising director at the CBA, Liz Adams, this is still a common trend among student business owners and entrepreneurs. “Most students come in planning to work, but many have an interest in becoming entrepreneurs over time,” Adams said. Since Yandora’s unexpected career move, he has serviced numerous students looking for their fix of classic Marvel GI Joe and Deadpool comics, or DC Comic Batman and Wonder Woman reads. Yandora is constantly researching new releases, following reviews and asking customers for their input. Under Yandora’s supervision of Phantom of the Attic, the store split into two locations on Craig Street, with one primarily for comics and the other for games of all sorts, including card games, board games, miniature games and war games. But he said the future is in technology, and advises Pitt entrepreneurs to look toward that field for opportunity. And while Yandora has had much success in maintaining a steady flow of customers and quality service, he is always vigilant and aware of the bigger competition, such as The Exchange on Forbes, or even larger retailers like Barnes & Noble. “All this stuff, I guess you could call it geek culture, is becoming more popular. It’s definitely become more mainstream,” he said. But that hasn’t necessarily meant that the standards have risen. “Comics are a special kind of medium that need to be treated as such,” Yandora explained. He said that many publishing companies are getting so concerned with production and sales, they are losing their artistic quality. Yandora, like all resolute owners and entrepreneurs, is optimistic that the character of his company and the personal element of his approach will carry the business.